The major art pieces, most important artists, and significant artistic movements from 35,000 BCE to today are collected together in this easy-to-read resource on art history. It leads you on a tour from the basics and beginnings of art to the various directions that art is heading today. You’ll not only learn about paintings, but also every other medium imaginable, including sculpture, architecture, pottery, photography, installation art, and even film and video games. The nearly 150 color images illustrate artistic concepts and highlight important and memorable artworks. 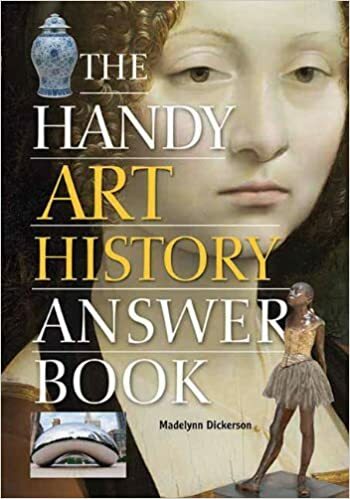 Loaded with 800 questions and answers on art principles, techniques, materials, forms, colors and styles, movements, schools of thoughts, evolution and meaning, The Handy Art History Answer Book is a fascinating journey around the world and through the ages. Why do Egyptian figures have two left feet? What is the difference between weaving and tapestry? What happened to the Venus de Milo's arms? What is considered beautiful in Islamic art? How can you recognize "a Michelangelo"? What is the significance of the Aztec eagle-man? How did Cezanne “astonish Paris with apples”? What is the difference between Art Nouveau and Art Deco? Why do Jeff Koons’s balloon animals sell for millions of dollars?